There’s plenty of buzz these days about creating an inclusive workplace environment, but what does it mean? If you think about the word inclusion, considering what it means, you’ll probably think about belonging, connecting with others, and being part of a community. At work, inclusion means all the ways, great and small, that employers can help people feel comfortable and connected, a part of a well-functioning whole. Why is inclusion important, and what are the steps you need to take to create an inclusive workplace environment? First, let’s address the importance of this issue. According to recent research, workplaces with an inclusive culture are twice as likely to meet their financial goals or even surpass them, and six times more likely to be innovative. They’re 42 percent less likely to lose employees because when employees feel that they can bring their whole selves to work, they’re unlikely to look for a new position. Engaging your employees and helping them feel connected and included is good for your people, and good for your business. To create an inclusive workplace, strive to make develop a corporate culture that’s cooperative, collaborative, fair, open, curious, and accountable, by incorporating seven components of inclusion. The right resources give employees they support they need to be inclusive. 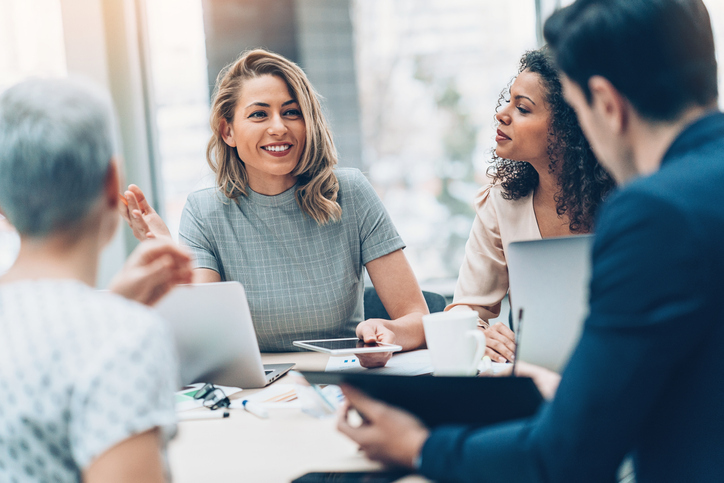 Give your employees access to appropriate technology, help them support each other through employee resource groups, and encourage them to make meetings more inclusive by sending agendas and other materials in advance. When everyone at the meeting is prepared, and technology is set up properly, it becomes easier for all the members of the group to be actively involved. One of the most important ways to include someone is to allow them to have a voice. When employees have a say about decisions with an impact on their work, they take more ownership in that work and tend to work harder. They gain a higher level of job satisfaction, which in turn improves their performance. When employees are allowed to talk openly, it helps them trust their leaders, and an environment of trust inspires creativity and productivity. What’s more, companies that listen to their people gain useful knowledge that improves their business. When employees feel that their company values them for who they are, they feel connected to that company. It’s important for individuals to be recognized for their uniqueness and to feel that their leadership values their skills and unique perspectives. To give employees this sense of belonging, speak to your employees with intention. Acknowledge their efforts, and highlight their specific achievements so that they know you value them and take pride in their successes. Encouraging collaboration helps teams feel connected to each other. This sense of connection gives them the ability to work together using the strengths and skills of each individual. In meetings, take the time to ask for feedback and acknowledge the source of good ideas, even if that person is not in the room. Inclusivity relies on intentionality. Look for ways to weave inclusive practices into the culture, values, and mission of your company. Make it clear that you value diverse ideas and perspectives, and show this through inclusive practices. Find exciting ways to make people feel like they belong. Create social events and utilize social media to engage employees and help them to connect. Employees who have the opportunity to learn and grow will be more likely to want to advance their careers within their organization. Look for ways to empower your employees with learning and development opportunities that help them expand both their personal and professional goals. Find out what interests them and encourage them to pursue their passions and hobbies, learn new skills, and further their education. One way to strengthen the unity of your group is to hold training sessions off-site, where team members can learn together and form bonds. At Texas Training and Conference Centers, we pride ourselves on providing companies with training facilities that feature high-quality equipment and exceptional service. Our computer labs and other spaces come equipped with internet accessibility, printers and fax machines, Wi-Fi setup, on-site tech support, full projection systems, workstations, whiteboards, and computers furnished with the most cutting edge technology, to ensure that your training event is a success. Soundproof rooms, continental breakfast, and optional catered lunches are just a few of the other ways we provide the little niceties that make a big difference for your event. For the past 18 years, we’ve provided exceptional service to businesses throughout Houston, and we have the expertise to help you make your event a success. To learn more about Texas Training and Conference Centers, call us at 832.982.1708 or contact us through our website.